Really like those colourful tomatoes with their healthy heart friendly antioxidant lycopene properties. Lots of varieties out there but at grocery stores for most of the year we see only the new breed of hard flavourless varieties that ship well. Frustration has compelled many of us to now grow our own from seeds in the backyard. This time of year during summer the farmer markets are full of heirloom tomatoes in their many glorious shapes and colours. The small orange Sungold and SunSugar cherry tomatoes are very sweet and most popular. Green are interesting particularly the Green Zebra with their intense tarter zippy energy. Japanese Black Trifele is dark red and rich. Yellow Brandywine are usually large softer and yellow. So many varieties to try and mix and match in pursuit of the perfect tomato. My preference still is Black Krim which always seems to be ripe enough – so juicy, sweet, and almost smoky. Do you seek out heirloom tomatoes? What is your preferred variety? 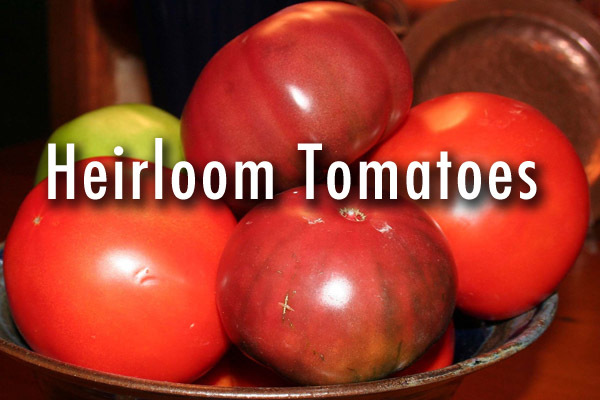 What's your favorite variety of heirloom tomatoes? We have several restaurants in Birmingham that are noted for their special creations of heirloom tomato salads during the season. They will typically have several different varietals used in their dish. My favorite of these creations is so popular, that the restaurant will advertise when it is available, and the locals will literally flock to the restaurant for the first servings of the season.